It freaks everyone out, but at some point or another, you’re going to be called to give an impromptu talk. Or maybe you’re speaking at an event and you learn the keynote speaker’s flight was canceled, and they call on you at the last minute. Or maybe you feel like the talk you prepared isn’t the right one, and you need to take things in a whole new direction, and you’re up in five minutes. As a full time communicator, I’ve been there…in almost every scenario you can think of. In any scenario, cue most leader’s worst nightmare: giving a talk with zero prep time. How do you not just panic, throw up, freeze like a deer in the headlights or ramble on like someone who had their brain removed? I was twelve years old when I gave my first impromptu talk. I was supposed to give a five-minute talk to our church family about the camp I’d been to that summer. Someone else was cued up to speak ahead of me, and she basically said exactly what I was going to say. So what did that twelve-year-old kid do? According to my dad, I walked on stage, made up a bunch of new points, and no one knew the difference. What started at 12 has happened more times than I can count since. Numerous times at events, I’ve watched the previous speaker cover points I was going to make. At that moment I know I have to pivot, and I’m up next. Apparently, this doesn’t only happen to 12-year-olds. Earlier this year I was at a conference when I learned the night before that the keynote couldn’t make it. I got asked to step in…in front of 3000 people. A few years ago at our church, we were in a video series with Andy Stanley and the video playback died. Just died. Right in the middle of the service. I’d heard the message at the previous service, but with literally 30 seconds notice, I got pushed onto the stage. The lights came up. I explained to the congregation that the video had died so I was up with zero prep, having heard the message once before. Then I proceeded to do the best I could to recite what I remembered from Andy’s message and improvised my own take. After the 40-minute message was over, people cheered. How do you carry yourself in moments like those? Look, I have a huge preference for writing messages months and weeks ahead of delivery, and highly recommend that. I outline an entire process for delivering amazing sermons and talks in my new course, The Art of Better Preaching. So 99.9% of the time, go with that. But at some point, with zero prep, you’re going to be pushed onto a platform to speak. How do you simply not freeze or stumble all over your words, or just meander your way to disaster? Here are 5 ways to handle that moment when it comes. The biggest enemy you have when you’re called on at the last moment and you panic is you. Your emotions will threaten to hijack your brain. You’ll convince yourself that you’re not able to do a good job, that this is unfair, that you haven’t got it in you to rise to the occasion. Start believing that, and the voices in your head will be 100% accurate. Except they’re not. You can do a good job. And no, it’s not unfair (people want to hear from you) and you’ve got this. The best way to deal with your natural fear is to push past it. So push past it. After all, this is happening, and you’re more ready than you think. So, shift your view for a moment and think about what your audience needs. What do you possess that might help them? How can you empathize with what they’re going through? Speakers who care about their audience will always have a more engaged audience. 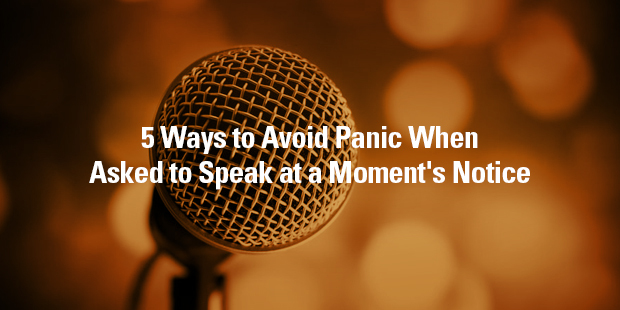 Great…so you’ve thought (even momentarily) about your audience and tried to silence the panic in your head and heart. Your mind might naturally want to focus on what you don’t know. After all, you couldn’t prepare. No research. No carefully crafted phrases. Zero prep. Your head will go back to this: clearly, I can’t tackle this. You’ve got a few decades of life under your belt, and you know something. 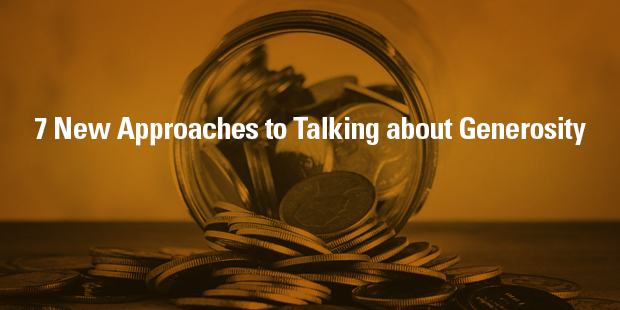 For professional communicators (preachers, leaders), you’ve likely got a few talks under your belt that you can cherry pick from. Do it. Pull from that sermon you preached last September or that talk you gave in June. It’s not unfair. And it’s not cheating. It’s called serving your audience well. And if you go with what you know, you’ll be coherent. A coherent you is better than a rambling you. Even if you’re not in the habit of speaking, you know a lot about some things. Draw on that knowledge. When you panic, you’ll be tempted to focus on what you don’t know. Focus on what you know instead. You know way more than you think. In all impromptu talks, here’s a principle that simply works: pretend you’re having a conversation. Because you are. Why does imagining you’re having a conversation work? Because you do it every day. Think about it. That’s the thing about conversations….you just have them. Pretend you’re talking to one person and just explaining your thoughts, ideas and feelings. You’ll be amazed at how easy it is. A conversation has a natural flow. Go with that flow. Your accumulated lifetime experience of interacting with other people will move you toward forming an introduction, a main point (or points) and an ending. The pressure of speaking in front of a live audience will help you stay focused, sharp and concise. So…you have conversations all the time that you never prepare for. And you’re fine in them. This time, a bunch of people just happened to show up. Of all the things communicators struggle with, this is one of the worst: we convince ourselves we don’t have enough to say to fill the time. First, that’s almost never true. Most speakers and preachers go over time, every time. Cue the buzzer for that habit. Second, the audience is almost always grateful when a speaker finishes on time and extra grateful when the speaker wraps up early. If you run out of things to stay (and you might), stop. Even if you’re done early. Cue the thunderous silent applause going on in every audience member’s head. People are incredibly grateful when communicators realize they’re done. A communicator who knows they’re done before the audience senses they’re done is a wise communicator. So that’s it. A five-step strategy to help you nail an impromptu talk, or at least not blow it. What are some other things you’ve learned that help you give a decent impromptu talk? Okay. Working smarter is better than simply working harder. Very true. This myth is so seductive. There will be a day when I become a good enough leader that I will announce our next move and everyone will applaud wildly, right? You might get most people to buy in, but you will never get everyone to buy in. This kills most leaders because it causes them to procrastinate. The myth makes them ‘wait’ until all the conditions are right to launch their big move. Conditions will never be perfect. ‘Everybody’ will never buy in. Sometimes you just need to lead. If you want to read more about how to lead change in the midst of opposition, I wrote Leading Change Without Losing It: Five Strategies that Can Revolutionize How You Lead Change While Facing Opposition to help leaders lead without universal buy in. So there’s one thing that will turn everything around right? A silver bullet? A model I can just embrace and press play and everything will magically be wonderful? Right? Was a North Point strategic partner, my church would automatically grow…. Had person X on my staff, all our problems would be gone…. As my friend Casey Graham says, systems trump silver bullets. And they really do. If you have a problem, the system you’re using created it. To change the outcome, change the system. There is no easy way out. And if you do, you’ll arrive to learn you’ve missed the point. Effective leaders keep growing. They never stop. One of the characteristics of great leaders who stay fresh is curiosity. (I actually write about the connection between curiosity and cynicism in my new book, Didn’t See It Coming.) Top leaders are just relentlessly curious, and the curiosity keeps them growing. Organization that become complacent, like people who become complacent, inevitably decline. The more successful you are, the more you will be tempted to think you have arrived. That’s why the greatest enemy of your future success is your current success. 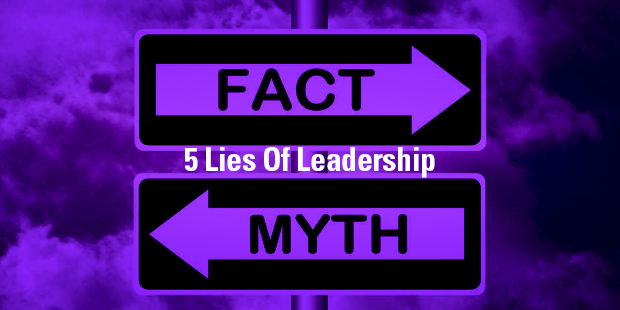 Busting those 5 leadership myths have helped me grow as a leader. How about you? What myths are you busting through? If you’re under 40 and are working for an over-40 boss, you’re probably restraining your eye-rolls as you notice that people just don’t seem to understand you. Younger leaders tend to love flexibility, the freedom to work remotely when they want, the ability to call some shots and the ability to develop a side-hustle, all of which seems to either baffle or frustration older leaders. Many (not all, but many) older leaders would rather see team members have one job (no side-hustle), do their work from the office, be available after hours just in case, and earn a seat at the table before they give much input. And they don’t get the lack of loyalty that they feel a lot of younger adults display. All of which frustrates younger leaders. I run into this tension every time I talk to leaders about how the workplace is changing. Over-40 leaders are smart to study how things are changing so they stay relevant. After all, the gap between how quickly you change and how quickly things change is called irrelevance. Younger leaders are smart to understand the tension because it will make for far less frustration on their part, and help them advance in the organizations they’re a part of. I’m an over-fifty leader who’s worked in offices in business and church, in a hybrid environment where some work is remote and some is done in an office, and now run a 100% virtual company that handles my speaking, writing and podcasting. In addition, almost all of my team members these days are pretty much Millennials or Generation Z. Here are five things I’ve noticed about a changing workplace, and how older and younger leaders can get along better at work. Every once in awhile you have this moments when you realize how rapidly culture is changing. One of the reasons offices used to make sense for everyone a generation ago is because the means of production were stored at the office. Your company held the typewriters, meeting spaces, computers, paper, pens, phones, copiers, fax machines and all the things private citizens didn’t usually have. There was a clear line between work life and home life. Now there’s a very good chance you’re holding almost everything you need to do your job in your hand. Plus your phone, tablet and laptop travel with you everywhere. What about meeting spaces, you ask. Well, between coffee shops, co-working spaces and restaurants, the need for offices has plummeted. Older leaders still think about ‘going to work’ because that’s how they cut their teeth. Younger leaders realize you don’t go to work; the work goes to them because they are the work. As a result, they love to work remotely at least some of the time—from home, from a coffee shop. Older leaders often see this as lazy. Younger leaders see this as normal. As Bryan Miles has pointed out about virtual culture on my leadership podcast, remote workers aren’t lazy; lazy workers are lazy. If you have a lazy worker…deal with it. But often remote work can be far more efficient. There are fewer water cooler conversations, fewer random and useless meetings, fewer interruptions and less distraction. So does that means offices are gone forever? No. In a hybrid company that allows some remote work, core hours are a great idea where everyone is in the office, say, on a set day or in a set window to improve team interaction or for meetings. But beyond that, an office isn’t nearly as necessary as it used to be. One of the challenges is that office work took its early cues from manufacturing. It make total sense if you have a car assembly plant (or a coffee shop, or a retail store) to have workers show up exactly on time for a shift. Because offices at one time owned the means of production (see above) it kind of made sense to the same thing. But where most of the work is relational, informational and flexible (i.e. almost all white collar office jobs), 8-4 no longer makes sense. After all, unless you’re on the reception desk or doing some kind of work tied to fix hours, you can do most things any time. Yet far too many older leaders are stuck in a mindset that people have to be in the building at set hours. As a result, too many people show up at 8 (or 8:05 or 8:15) for no particular reason. It can create a clock-watching culture (is it 4:30 yet? Do I get paid for this lunch???) where your team is in a set place for no discernible rationale. So here’s the question for leaders: are you paying your team to show up or are you paying your team to produce? If you’re paying your team to show up, that’s one thing. But if you pay them to produce, outside of fixed meetings and shared team time, why not let them choose how and when to produce? Here’s what’s changed: The old economy paid people to show up. The new economy pays people to produce. As I share in my productivity course, The High Impact Leader, some of your team’s best productivity might happen when no one’s in the office or working. So why stifle that and make them show up because someone decided that’s when they should work? Sure, that might sound strange, but hang on and try to get into their head space for a minute. First, any younger leader realizes they will likely NOT work for the same organization for 40 years and retire. 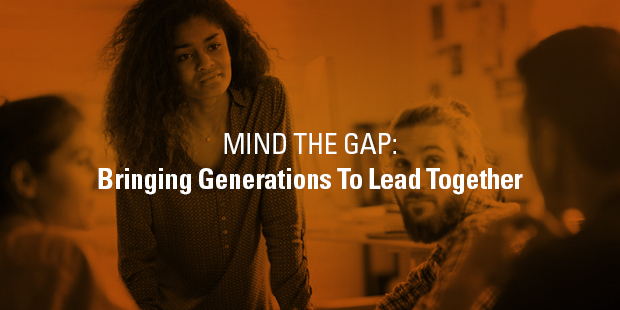 Not only are the pension plans of the 60s and 70s long gone, but the workforce changes so quickly that most younger leaders expect to have multiple careers throughout their life, not just multiple jobs in different organizations. Second, thanks to technology, the start-up culture is huge. Many leaders realize they can start things far easier than people could a generation a year ago. You can influence the world through your keyboard, your phone or a microphone. It used to cost millions to launch something. Now you can launch something on a Saturday morning for the price of a phone. What this means is that most Millennials has subconsciously realized they have to create a life plan that’s independent of any employer or organization. This isn’t fatal to any organization once you understand it. What it means though, as a leader, manager or boss, is that you need to come alongside them and help them realize their objectives. If you see those life objectives as competing with your objectives, you’ll lose them. If they see that you want them to win, they’ll hang around a long time. Here’s the bottom line with young leaders: If you help Millennials win, you’ll both win. If you merely want them to help you win, you’ll lose. So you hire a young worker only to find out he or she has a design business on the side, or that they’re writing a book or launching a podcast or starting a blog. Are they being disloyal? Do you rope them in and tell them to give you 100% of their time? First, you don’t own 100% of anyone. Any leader who tries to micro-manage the entire lives of their employees won’t have employees for long. You’re really only managing 25% of any full time employee’s life anyway (40ish hours of 168 hours). Controlling bosses in the future will have less and less to control all the time. Second, the side-hustle is here to stay because the gig economy (freelancing) is here to stay. 63% of free-lancers today say they started by choice, not by necessity. By 2027, the gig economy will be over 50% of the economy. So to think you’re going to have a work force that has one job and stays with you forever really puts you back in 1965. Brian Houston, founder of Hillsong, has some incredible insights on how to keep young and talented leaders over the long haul. Hillsong has done an exceptional job of keeping great talent and giving them freedom to express themselves in their lives and in their leadership. His advice? If you want eagles, raise the ceiling. Older bosses need to realize that most young leaders really do want to work. They just want meaningful work. You know the stereotype: Millennials want to change the world and believe they can do it. Again, before you roll your eyes, remember (older leaders), you raised them to have values like these. And some of them are doing it. So cut the cynicism. What this means though is that your mission is more important than ever. Leaders who want to preserve the institution, pad the bottom line, or simply grow the organization will always struggle to attract and keep young leaders. For the church, this should be easy. If you’re truly mission-driven (you want to reach people or impact your community), your ethos has an instant appeal to younger adults. Just keep the mission central. If you’re in business, profit won’t be nearly the motivator that cause is. If you don’t know what your cause is, figure it out. Similarly, you might think of yourself as a great leader people want to work with (actually, that’s usually a sign you’re not a great leader), but I promise you Millennials aren’t that impressed with you. The best way to attract and keep young leaders is to work withthem to accomplish a greater purpose. Leaders, if the mission isn’t bigger than you, you need a new mission. This sounds like a bit of a show down but I promise you it doesn’t have to be. For older leaders the most important shift to make is to manage outcomes, not process. Don’t value leaders for showing up. Value them for what they contribute. Don’t tell them how to get it done, just hold them accountable for getting it done. Leaders who manage the what and why and flex on the how will have a bright future. Leaders who manage outcomes and rally people toward a higher mission will always have a steady supply of young leaders lining up to work with them. I share some additional insights about working with Millennials in this post. Well, first of all, flexibility by your boss is not permission to be lazy. Hustle hard, but produce. Second, gain influence by being ridiculously great at what you do. If you want to know how to gain influence when you’re not in charge, check out this interview with Clay Scroggins. What are the frustrations you experience as a younger or older leader? If you track attendance at your church (and who doesn’t), the vast majority of church leaders are tracking numbers that probably bother them. That can lead into a death spiral of trying to drive greater attendance, only to discover more disappointment down the road. The mission of the church is the same in every generation. But the methods we use—our strategy—has to change, as I outlined here. So what’s one of the biggest changes we’re going to see? If church leaders put as much effort into trying to engage people in the mission of the church as they used to (or still) put into trying to drive attendance, they would see a huge spike in both engagement and attendance. Conversely, leaders who focused solely on attendance or misconstrue what engagement is will continue to see declining attendance. At Connexus Church, where I serve as Founding and Teaching pastor, we’re seeing encouraging spikes in physical and online attendance (the two are not mutually exclusive) at established locations, our online campus and our new location. So why is engagement the new attendance? When did we get the idea that church attendance was the ultimate goal? Flip back to New Testament days. In other words, you were engaged. You didn’t attend Jesus. You followed him. A similar dynamic emerged in the first-century church. Early Christians didn’t attend church. They were the church. If you look back at the genesis of the Jesus movement, the idea of attendance as a hallmark would have been completely foreign. You only attended because you were engaged. Period. The big idea was this: come, and eventually you’ll get engaged. That worked (quite effectively, actually) when people used to flock to church. 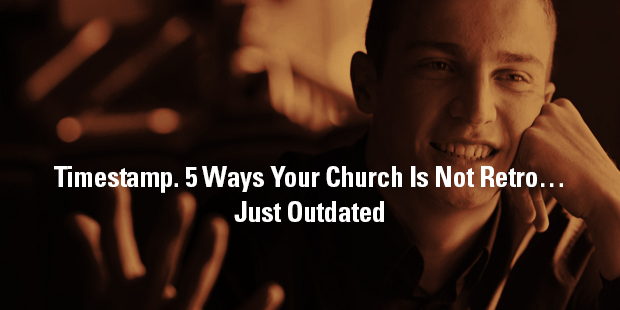 But in an era when the number of unchurched is constantly on the rise and even Christians don’t attend church as often anymore (here are 10 reasons for that), that strategy is becoming less and less effective. Yet, many churches (even growing churches) are still counting on getting people to attend, hoping it drives engagement. 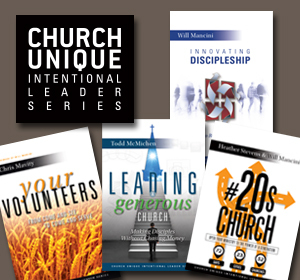 The shelf life of that strategy is limited because the number of people who want to attend church drops every year. To say it clearly one more time, in the future church attendance won’t drive engagement; engagement will drive attendance. In the future, the engaged will attend because, in large measure, only the engaged will remain. I am all for making church as attractive and accessible as possible. Well, as outlined above, when attendance was more normative and in some senses ‘automatic’ in our culture, attraction was a decent strategy. Because people would go to church, creating a better church was a good approach. But (and here’s the underbelly), it also fed into consumerism. Consumerism has defined the last century of North American and Western culture. To some extent, the attractional church has played into consumerism. Build something attractive and people will come. But in the process, building attractive, relevant churches has had an unintended side-effect: people have come to evaluate church by what they get out of it, not by what they put into it. Again, I’m not slamming the attractional church. I’m all for building bridges to the culture, not erecting barriers. Anyone who knows church knows that at the heart of every attractional church is a core of Christians who sacrifice—who give, who serve and who invite. Those critiques are not without warrant. As a more selfless church emerges (even excellent, selfless churches), that will drive more curiosity and interest from unchurched people. A final reason that engagement will drive future church growth is simply this: people become most passionate about the things with which they’re most involved. Just talk to a football dad or a baseball mom. Or your foodie friend who just found yet another recipe. Or your triathlete friend who set another personal best. Engagement fuels involvement. Involvement fuels passion. Passion fuels invitation. That’s why your friend wants you to try that recipe, to watch the game with them and at least attempt a 5k. Engagement leads to invitation. Invitation leads to unchurched people following Jesus. In many ways, this can only be a good thing. It’s easy to get discouraged about the future of the church. While the world seems to be falling apart, so does the church. 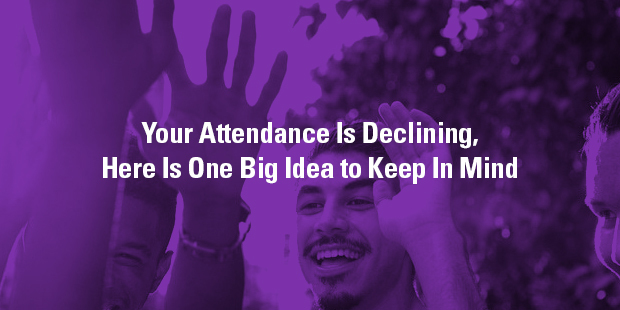 Attendance in many places is shrinking, not growing. Even committed Christians are attending less often (here’s why). And young leaders aren’t exactly flocking into ministry. And often we shoot ourselves in the foot, with everything from Pharisee-like self-righteousness to downright stupid things Christians do (here are 5). Yet it’s not all gloom and doom. I’m an optimist. You can always find the opportunity in every obstacle. As you think about the future and how you need to change as a church, here are 5 principles that can guide you and your team. The truth about our culture is this: thanks to an abundance of technology, we have never been more connected as a culture before, and we’ve never felt more disconnected. As our lives have moved online, and as people have become more mobile and even (in growing numbers) location independent, people have never felt more lonely. We know our neighbors less than we ever have before. It’s really hard to love someone you don’t know. Our social media feeds give us the illusion of community. But read between the lines and you’ll see intense loneliness and even the re-emergence of tribalism where we only (virtually) associate with the people who agree with us. The number one answer? Nobody. People may have friends, but few have deep friendships, friendships that can carry the weight of life and faith and hope and meaning and existence. The church hasn’t done a great job of community in the past. We claim to be friendly, but that usually only means we’re friendly to each other. And catching up on what happened this week and talking about sports or the weather is hardly what Jesus had in mind when he told us to love one another. But the truth is the real mission of the church is relationship. It defines the vertical nature of our faith (love the Lord your God with all your heart, mind, soul and strength) and the horizontal essences of Christianity (love your neighbor as yourself). If anyone can get relationship right, it should be the church. So ask yourself as a church leader: what are you doing to forge the deepest relationships you can forge in this life? Nobody should be able to out-community the local church. In the same way that our lives are awash in hundreds or thousands of half-real relationships thanks to our phones, we are also drowning in a sea of information. Never in the history of humanity has so much useful and useless information been available to so many so quickly. And we have no idea what to do with it. The current and future crisis is not a crisis of information, it’s a crisis of meaning. You’ve felt this every time you’ve scrolled through your social media feed and thought “there is nothing of value here at all”. In fact, on some days, the constant rants, drivel, trivial observations, bragging, self-promotion and complaining has made you think about giving up social media altogether. The challenge for leaders moving forward is not to produce more content. The challenge is to provide meaning. I believe the future belongs to leaders who broker meaning in the sea of endless content. It follows, then, that the key to providing meaning isn’t more, it’s better. More content will simply get lost the constant chatter. More without meaning will make you less relevant. You become yet another unhelpful voice. Better is not nearly as easy as more. Better requires thought, reflection, digestion and ultimately resonance (it’s resonance that tells you your content is connecting). 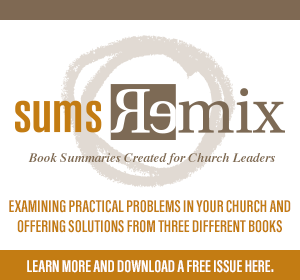 This provides a huge opportunity for church leaders. Who better to provide meaning than the leaders called to share timeless truth in an era starved for meaning? And for business leaders, the opportunity to stand out with your customers, your peers and your clients is right in front of you. Just know that the race to produce more will compete with the need to produce meaning. The meaning-brokers will win the race. Leaders who read widely, digest, think, and above all publish content that actually helps people find meaning will become THE leaders in their field. Narcissism is a rapidly growing problem in our culture. You feel the pull to make your life all about you. I feel the pull. And we see it all over our culture. The Gospel offers a powerful counterweight to selfishness; it calls us to die to ourselves. When Christians do this, amazing things happen. A life defined by generosity and service to others (especially those in need) is increasingly attractive to a world suffocating on itself. A life devoted to the Kingdom of God stands out in a world devoted to the Kingdom of Self. The church is just as guilty as the culture when it comes to narcissism. We can get obsessed with ourselves as easily as anyone. 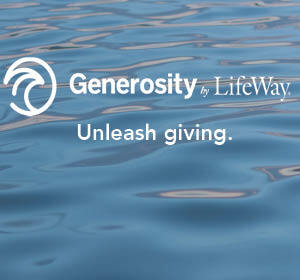 But the opportunity to live generous lives of service to Christ and to others is a tremendous opportunity. Those disciplines put flesh on love. The more Christians sacrifice their own wants and needs for the sake of the Kingdom, the stronger the church will be. There’s even a promise in that. When you die to yourself, something greater rises. You know what’s missing in the cultural dialogue these days? Hope. We seem to do a great job focusing on the problem and pointing out the shortcomings and sins of others and very little time pointing toward a preferred future. We’ve read to the end of the story. We know how this ends. Love wins. Faith wins. Hope wins. Christian hope isn’t a pie-in-the-sky that floats above reality. It’s as gritty as the incarnation, the crucifixion and the resurrection of the dead. Which means our message and lives need to get into the grit of addictions, conflict, brokenness and the utter fragility of life and fight for hope. As Bruce Cockburn said decades ago, you need to kick at the darkness till it bleeds daylight. Hope that’s divorced from reality isn’t hope at all. But hope that goes into the darkest places and cracks open a thin wedge of light that eventually floods the room is exactly what we need. So deal hope. Real hope. It’s what our hope-starved world craves. So where does that leave you and me? It probably leaves us changing our churches. Cutting through the junk of who we are. Tearing away the parts that don’t work and replacing them with an authenticity and power than do. This is true whether your church is 50, 500, or 15,000. It’s true whether it’s growing, flat or declining. Radical change outside the church demands radical change inside the church. Just because you shouldn’t change the message or the mission doesn’t mean you shouldn’t change the methods. If you don’t change, irrelevance is a hairbreadth away. An unwillingness to change is what’s fueling the decline and stagnation of 90% of all churches in North America. Here’s some hope for churches that are willing to have the tough conversations and undergo a radical transformation: the future of THE church is secured. Because the church is Jesus’ idea, not ours, the future of THE church is guaranteed. The mission belongs to Christ, not to us. And he has more invested in the future of his church than all of us put together. If you make your mission THE mission you will always have a future as a church. Ever wonder why some leaders hit home runs—or even change the world—and why others don’t? I wonder about that all the time. Recently I spent a few days in Silicon Valley, the tech and startup capital of the world—a strip of cities that run between San Francisco and San Jose California. It was exciting for me. A number of podcasts I listen to are based out of Silicon Valley. For years, I’ve read and listened to stories of entrepreneurs, startups, venture capitalists and bootstrappers who have one thing in common—they live and work in Silicon Valley. My wife and I roamed through San Francisco, Cupertino and almost everything in between. Our hotel was right on the border of Menlo Park and Palo Alto, literally five minutes from Steve Job’s house. You can’t get further into the heart of Silicon Valley than that. We ate in restaurants frequented by VCs and entrepreneurs (one turned out to be a place where Tim Ferriss eats) and walked the streets where the founders of Apple, Google, Facebook, Nest, LinkedIn, eBay, Lyft, Uber, Twitter, YouTube, Box, Airbnb and more hang out. There are lots of theories about why Silicon Valley has been so successful in being a hotbed of innovation (like the ones this HBR article outlines), but what struck me about Silicon Valley was what I didn’t see. Here are 5 quick and surprising leadership lessons I took away from my weekend in Silicon Valley. I don’t know what I imagined Silicon Valley to look like, but the truth is it looked surprisingly…normal. I’ve had the privilege of traveling to hundreds of cities and communities across North America and around the world. Silicon Valley didn’t look that different than many other places I’ve visited. There were relatively normal office buildings that bore unusual names like Nest or Greylock. The buildings weren’t spectacular. What’s happening inside them was. Ditto for Apple’s current campus. While their new campus looks like a spaceship, their current campus (which they’ll continue to use) is beautiful but not that remarkable. Palo Alto, Menlo Park or Cupertino are decent places for dinner or hanging out at night, but they’re not that different than many other towns and cities I’ve been in. Stanford is right next door to many of the startups, as is Berkley. But again, there are hundreds of universities that don’t produce nearly the entrepreneurs that these two schools do in Silicon Valley. Sometimes as leaders we convince ourselves that we need a better building, a better location, or a better anything to be innovative. Innovation almost always comes from otherwise normal looking environments. In a similar way, stories about the perks of working at startups are legendary. Whether it’s gourmet onsite kitchens and chefs, gaming and foosball tables, free gym memberships, stock options or big maternity/paternity benefits, stories abound about how generous Silicon Valley companies are to their employees. Yet the perks didn’t make any of these companies successful. The work did. In an age of instant entitlement, many of us want the perks without putting in much work. Apple started in Steve Job’s parents’ garage and Facebook was headquartered out of a dorm room long before anyone got preferred shares or free food. In fact, in the early days of any company or organization, nobody’s thinking about the perks. They’re singularly focused on the work. Similarly, if you want to make progress, focus on the work, not the perk. Take it a level further. If you’ve had some success and you’re enjoying a few perks, the best way to kill your future is to focus on the perks and ignore the work ahead. As soon as you start to love perks more than work, the end is near. So what makes startups so successful? A lot of it is years of hard work before breakthrough. If you look at most leaders and organizations who break through, there’s a relentless pursuit of a goal. Apple took off in the 70s and 80s, but almost died in the late 90s. Its real breakthrough happened in 2001 and again in 2007 with the introduction of the iPod and iPhone respectively. The iPhone came 31 years after Apple’s founding. Airbnb went through many incarnations and almost died several times before it reached its tipping point several years after its launch. It’s easy to dismiss someone as an overnight success. But you’re missing the point. Most overnight successes are preceded by a very long night. I talk to leaders almost every day of my life. One of the things you can spot almost immediately in talking to a leader is their mindset. What’s prevalent in the Valley is a can-do mindset. It’s populated by people who believe they can make a dent in the universe, that they can disrupt industries, that they can innovate in a way that changes the world. And as a result, many do. The mindset goes far beyond initial success. One of the huge advantages to being in Silicon Valley is it surrounds you with innovative people. Some of the most advanced thinkers on the planet have gathered there, along with creatives, engineers, designers, entrepreneurs, venture capitalists, investors and so many others. Obviously, this is an incredible incubator for innovation, new ideas and fresh approaches to the problems we face. But it’s deeper than just ideational synergy. One of the greatest dangers of leadership is isolation. 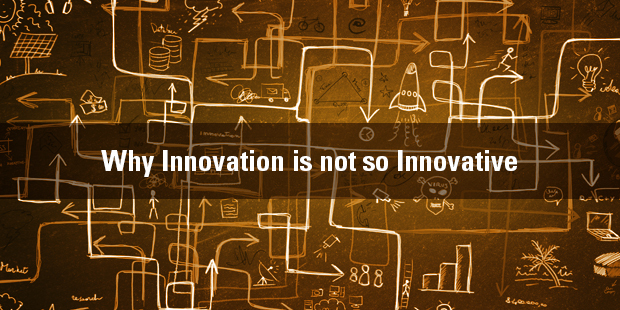 Innovators tend to be outliers in their denominations, industry or field, and outlier often equals outcast. It’s critical for innovative thinkers to surround themselves with people who inspire them and challenge them, because normally what happens is your friends and colleagues shoot you down. This is one of the reasons so many denominations and industries are in trouble today: they shoot their innovators. In many ways, Silicon Valley is the Island of Misfit Toys. Apple’s famous ad makes even more sense when you consider the synergy in the Silicon Valley of people who didn’t fit in elsewhere. Get enough people around you like that, and not only can you can disrupt the status quo, you probably won’t quit when you’re trying to do it. Too many leaders quit moments before their critical breakthrough. If you surround yourself with support, you’re far less likely to do that. Have you been to Silicon Valley or read up on it? One of the ways you know you’re making progress is that you stop having the same discussion over and over again. If you’re discussing the same issues on your team or at home year after year, you’re probably stuck. When it comes to much of the discussion around discipleship, I believe we’re getting it wrong in the church. What if the popular understanding of discipleship is producing some of the ill health and even stagnation and decline we see all around us in the church? And what if you could do something about it by rethinking what you mean by discipleship? From my earliest days in ministry, I’ve had a conversation about discipleship that repeats itself again and again. Me: People need to reach out more and focus more of their time, energy and resources on evangelism. 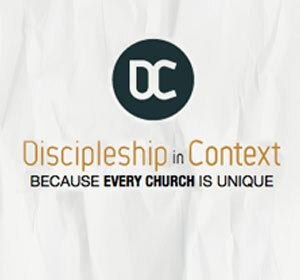 Other person(s): That’s a great idea but what we really need to focus on is discipleship. There’s such an immaturity in Christians today that we need to focus on growing the ones we have first. And besides, evangelical churches are known for producing shallow, immature Christians. Unless, of course, it’s wrong. The goal is not to know, but to do something with what you know. I wrote more on why our definition of Christian maturity needs to change here. 1. Jesus Commanded Us To MakeDisciples, Not Be Disciples. The way many Christian talk, you’d think Jesus told us to bedisciples. He commanded us to make disciples. 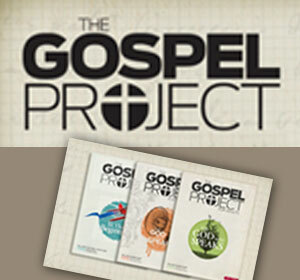 The great commission is, at it’s heart, an outward movement. Could it be that in the act of making disciples, we actually become more of who Christ designed us to be? It was in the act of sharing faith that thousands of early Christians were transformed into new creations. I know personally I grow most and learn most when I am helping others. It gives me a place to apply what I’m learning and to take the focus off myself and place it on Christ and others, where it belongs. 2. Discipleship Is Simply Linked To Evangelism. The thrust of all first century discipleship was to share Christ with the world he loves and died for (yes, Jesus really does love the world). You can’t be a disciple without being an evangelist. And for sure, the opposite is true. You can’t be an an evangelist without being a disciple. But somehow many many people would rather be disciples without being evangelists. 3. 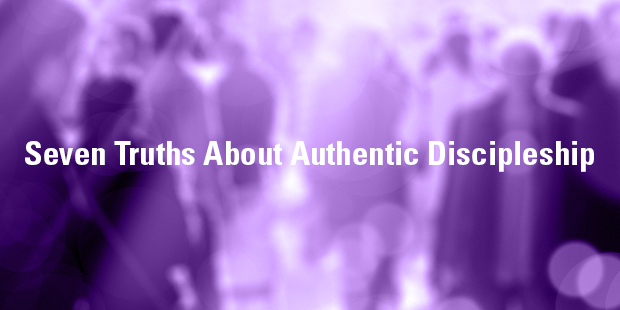 A Mark Of An Authentic Disciple Includes Getting It Wrong. A common criticism of churches that draw in large numbers of outsiders and newer believers is that these new followers of Christ get it wrong as often as they get it right. They might not realize that reincarnation isn’t biblical or struggle to understand the faith they’re stepping into. After all, Peter didn’t get it right most of the time when he was around Jesus. Many leaders in the early church needed correction. 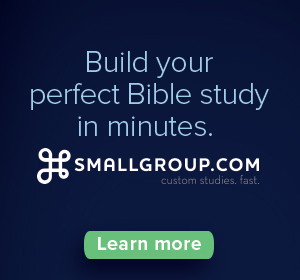 And even Paul would later confront Peter about his unwillingness to eat with Gentiles. And yet Christ chose to build the early church on Peter and Paul. Imagine that. If these issues remind you of why you so dislike growing churches or megachurches, just realize that I pulled every one of those problems out of 1 Corinthians. The church in Corinth struggled with every problem listed above and (I think) every problem growing churches today struggle with. And last time I checked the church in Corinth was an authentic church Christ loved. The fact that you have these problems may actually be a sign you’re making progress with the unchurched. You don’t want to leave them there, but when people really start engaging with Christ, tidy categories are hard to come by. In fact the most morally ‘pure’ people of the first century (the Pharisees) were the very ones Jesus most often condemned. Go figure. It would be great if there was instant maturity in faith and in life. But it never works that way. You can’t expect a 3 year old to have the maturity of a 13 year old, or expect a 23 year old to have the maturity of a 43 year old. When you place expectations on people that they are just not able to bear, you crush or confuse them. And yet we do that in the church all the time. People grow and mature over time. And our progress isn’t always as linear as a 101, 201, 301 progression would make it. In fact, I know some 23 year olds who are more mature than some 43 year olds. Expose new Christians to the love of God and community, to great teaching, great relationships, and solid accountability and over time, many will grow into very different people than they were when they first came to Christ. They may grow at different rates and in different measures, but I believe Jesus talked about that. Just don’t judge them after a few months or even a few years. 6. Christian Maturity Was Never About You Anyway. Christian maturity has never been about you anyway. It is certainly not about how awesome you are compared to others, how smart you are, how righteous you are, or how holy you are. It is about Jesus. And it is about others. It was never about you anyway. If you love the world, how can you ignore it? Jesus said the authentic mark of his followers is love. He defined the primary relationship between God and humanity as one of love. The truth he ushered in is inseparable from love. The primary motivation for evangelism and discipleship is the same; it is love. That should characterize both the discussion about evangelism and discipleship and also the way we go about both. This isn’t an exhaustive treatment of discipleship and evangelism, but in the time it takes to sip a coffee I hope it helps some way advance the conversation about evangelism and discipleship in your church. And if we advanced our understanding of discipleship in the church, maybe the church and our culture would be transformed. Ever think that growth will solve all your problems? It’s tempting to believe that. I know, because I still fall into that line of thinking unless I stop myself. I’d be the first to admit that I’d rather be part of something that’s growing than something that’s stuck or dying, but growth doesn’t mean your issues disappear. In fact, leaders of growing organizations just sign up for a new set of problems. While I’ll take those problems any day, they’re still problems. Having started ministry in very small churches, I can relate to each of these struggles personally. As our church has grown from a handful of people to 1,200 people who now attend and 2,500 people who call our church home, we’ve navigated all of these challenges. So has almost every growing church. What’s true in church is true in any organization or business. We’re even working through rapid growth issues associated with this blog, my writing, and my podcast. You hope and pray people show up, but when they do, you get a whole new set of challenges. As things grow, everything gets more complicated. It’s the leader’s job to create simplicity in the midst of it all. Bottom line? Your struggles as a leader or as a church don’t go away when your church or organization starts to grow. They simply change. 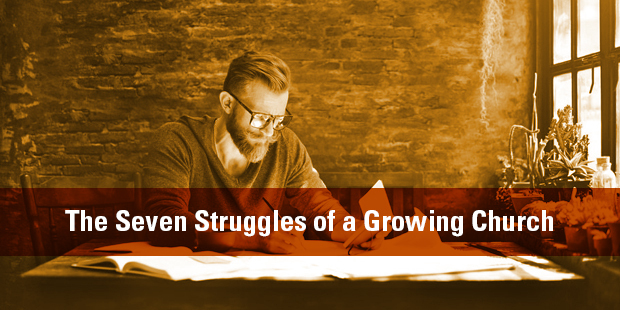 Here are 7 things every leader of a growing church or organization struggles with. I wrote more about scaling your ministry through different stages in my new book, Lasting Impact: Seven Powerful Conversations That Will Help Your Church Grow, available here. At 400, I let go of graphics and design entirely (thankfully). I also go out of direct involvement in student and children’s ministry as we hired people (I still share the the vision, but no longer own the responsibility). 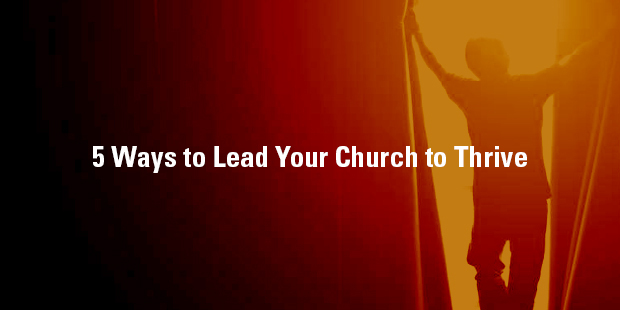 If you’re going to lead a growing church effectively, you have to begin leading leaders instead of leading people. If you’re not fine with others receiving the credit, you’ll eventually stunt the church’s growth to the level of your insecurity. If you struggle with insecurity, by the way, this is an amazing conversation with Josh Gagnon, who leads a top 5 fastest growing church in America and has had to battle his own insecurities in doing so. But you must shift from leading people to leading leaders if you hope to reach more people. Many entrepreneurial leaders are afraid of systems and structure because they think it means the creation of a bureaucracy. It’s much easier to say no when you have a clearly defined mission, vision, strategy and culture. Talk with an Auxano Navigator about the growth struggles you are encountering right now.